The measurement of the size and weight of grapevine berries may provide important information to assess differences in ripening stage, pulp/skin ratio and phenolic content of winegrapes. This task is usually done by hand, so that it becomes slow, tedious and inaccurate. A new method was developed to measure size and weight of grapes by image analysis. This analyzes every separate grape and gets its centroid then calculates the radius of the grape from this point looking for the pedicel and eliminates it. 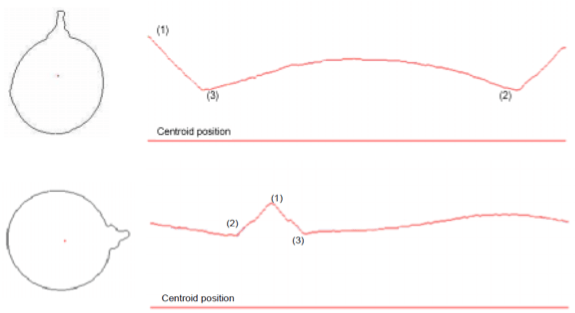 After that, the centroid is recalculated and the equatorial diameter is obtained as the length of the equatorial axis (line oriented 90º on the polar axis that crossed the centroid). A model was generated from the data obtained to assess the goodness of the system predicting the size and weight individual berries. Our results indicate that the vision machine system developed was also reliable for estimating size and weight of grapevine berries. Tardaguila, J., Diago, M.P.. Blasco, J. Millán, B. Cubero, S. García-Navarrete, O.L. Aleixos N. (2012) Automatic estimation of the size and weight of grapevine berries by image analysis. CIGR-Ageng-2012.